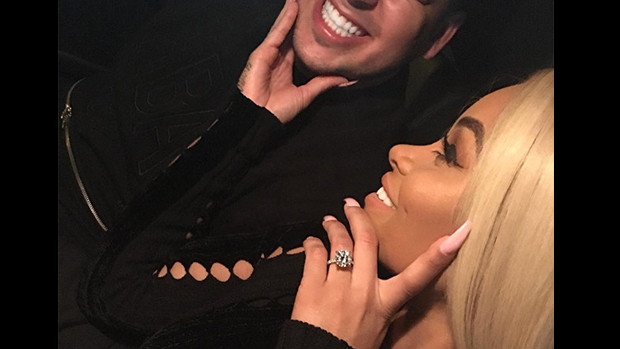 Yes, it’s true – Rob Kardashian put a ring on Blac Chyna’s finger and the duo is engaged after three months of dating. Warning, you may need some sunglasses for the 7-carat rock. Rob followed in suit with a picture of his future-wife showing off the bling, holding a stack of dollar bills. Not your typical engagement photo, but this is Rob and Blac we’re talking about. The couple continued the night with Snapchats, including a video of them smiling while listening to Kanye West’s song “Highlights” in the car. Did we mention the lyrics include, “Blac Chyna f—king Rob helped him with the weight?” Nothing like another great engagement photo opp! While the Kardashians and ex-boyfriend Tgya have yet to extend a congratulations, Blac’s pal Amber Rose had nothing but warm wishes. Check out the engagement pictures below.